Travis McGee is the strikingly handsome and ever resourceful invention of John D. MacDonald. Born in the author’s imagination in 1964, McGee drifted into the world on a 52-foot diesel-powered houseboat, the Busted Flush, which he has used as a base of operations through many adventures. In A TAN AND SANDY SILENCE, news of a former girlfriend’s mysterious disappearance leads McGee to the West Indian island of Grenada. There he takes on a whirlwind plot of double-dealing, shady financing and shifting identities. I am the type of person who takes a book with me everywhere; going grocery shopping, going to work (lunch break! ), and of course I have at least one when on vacation. So it was somewhat of a shock when I found myself staying at a friend’s beach condo without something to read. I’m an early riser and I like to spend a quiet morning with a nice cup of coffee and a good book. Thankfully, the best thing about beach condos is there is almost always a shelf of second hand books for guests to peruse. And that is how I picked up A Tan and Sandy Silence. I’m going to start with a warning. There will be a few spoilers in this review but I will not reveal who-dunnitt or ruin any part of the mystery for readers. However, these spoilers will discuss certain period plot devices that some readers may find disturbing. You will know about this stuff if you read any of the reviews on Goodreads, so it’s not really going to be a shock. I just wanted to let you know there are a few spoilers. You’ve been warned! Let’s get started with the positive. 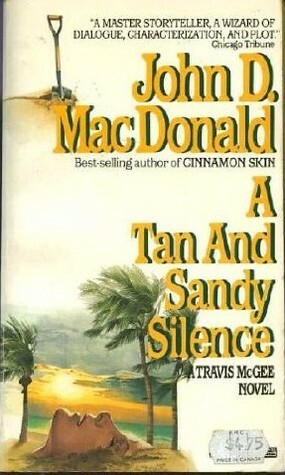 A Tan and Sandy Silence was initially published in 1971 (my copy was printed in the 80s) and it is the 13th book in the Travis McGee series. Trav is a private detective living a comfortable life on a boat in a south Florida marina. All is right in his world until a man he despises arrives looking for a lost wife and almost kills McGee in the process. This encounter has McGee worried for the missing wife, who happens to be an old lover, and he sets out on his own to find her. I’ll be honest; the setting and atmosphere is the primary reason I was drawn to A Tan and Sandy Silence. I instantly felt like I was reading a mixture of Miami Vice and Magnum PI (two shows I love) and the beach mystery was the perfect way to jump into summer. The mystery was intriguing, the plot fast paced, and I was pleasantly surprised by the retrospective moments presented by our hero. I like Trav McGee. He is a very flawed and yet extremely likable character. I was drawn in by how smart he is and yet not discouraged during his shallow self-pitying moments. You could easy imagine stumbling upon him at the end of the dock cleaning freshly caught fish while enjoying a cold one. And his reflections on human nature still resonate today even after 40 years since the book was published. It was a thrilling beach mystery that made me think! And that’s something I will always say yes to. Now on to the negative points…A Tan and Sandy Silence is definitely a product of the 1970s. Now for the previously warned spoiler, and well, all of the Goodreads reviews mention this scene so it’s not really a spoiler. About 2/3rds into the story, Travis strangles a female suspect during his interrogation. In my opinion the action was completely unnecessary, as it was rough, kinda out of character for McGee, and did nothing but cheapen the female character. However, I have to concede that I’m not sure what plot device could have been used instead. It did what it was intended to do; it let you know that this female suspect had no respect for herself and would do anything for money, including partnering with a man who threatened to kill her. I will add that one of two things could have happened after this scene. Travis could have taken advantage of the situation and I would have lost all respect for the gritty detective. Or he could have decided not to. I finished the story so that that for what you will. I will advise that the female characters are overly sexualize and are rather shallow. Note that I say SOME, as there are a few strong willed smart business women which was pleasant to read. However, I don’t recommend this story for those wanting well developed female characters. They just aren’t there. This book provided exactly what I wanted; a written story that invokes the same beachy nostalgia that I get when watching Miami Vice and Magnum P.I. Is it a work of genius? Nope. Is it on the top of my favorites list? Nope. Will I probably read another Travis McGee story? Absolutely! These are the type of stories I crave during Florida’s hot summer days, and you can definitely expect to find me enjoying a second hand Travis McGee story at the beach. So check out Tan and Sandy Silence and let me know what you think!